This cozy sweater is a fun and quick crochet project, perfect for cuddling by the fire or wearing just about anywhere. 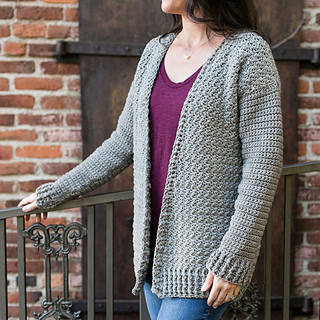 The Maylee is a beginner friendly drop shoulder sweater made with bulky yarn. It is comprised of five panels that are crocheted flat and sewed together as you go. The pattern includes all women’s sizes from XS to 2X, so you can make a comfy sweater for yourself or a beautiful gift for a friend. Finished circumference includes 8-10” ease. Model is 5’6” wearing size M/L. See finished dimensions chart on last page of pattern.